I have recently been discussing transport alternatives that are available to us once we have arrived at our destination with the motorhome. 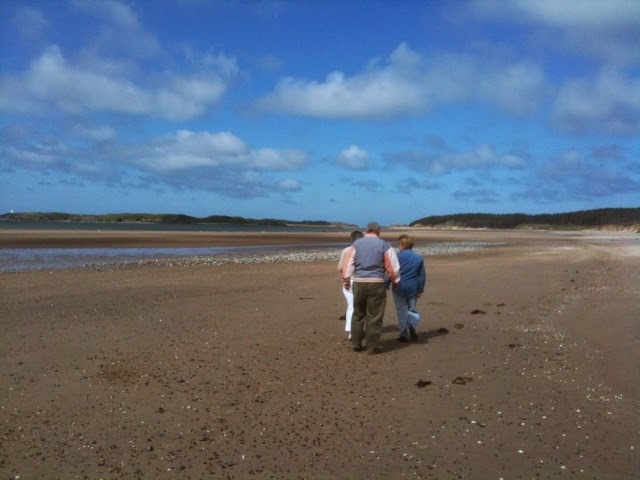 As a trial, we took our pedal cycles with us on our last trip, but having ridden around 5 miles on that occasion I decided that my pedal cycling days expired years ago, although Margaret took to it again much better. As a result I have been exploring other methods of transport. To take a small car would not only require a tow bar to be fitted, but would also require a small trailer, as using A-frames has been up for review by the all powerful EU recently, and they have already, or are soon to be banned from use to tow cars behind motorhomes, or any vehicle for that matter due to the issues surrounding the provision of braking. A trailer would also bring with it further driving restrictions. Read more on the subject here: Towing with your motorhome. I then looked at motor scooters to take with us within the large "garage" at the rear of our Rapido 963f A Class motorhome. This also revealed other considerations, which I have discussed in previous posts, not only in size and weight restrictions, but also in use of the main vehicle itself. 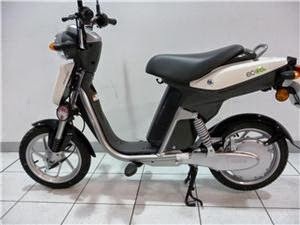 My choice was narrowed down to buying a Pulse Scout 49 - a small 49 cc 4-stroke petrol moped of Chinese manufacture, which measured up both in physical size and weight, or the newly launched Yamaha EC-03 electric scooter, (September 2012 in the UK). Both have their pros and cons, but I have now made my decision. The Pulse has no range restrictions, and, at a push, could carry both of us to wherever we wanted to travel. It's price is also very competitive, at £899 OTR new, but is of Chinese manufacture, which could bring with it some dubious build quality issues, no matter how many improvements have been made in recent years. 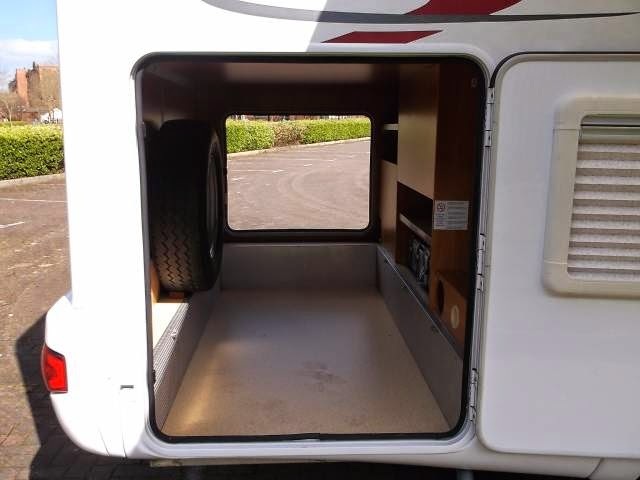 There was one in the showroom we visited today, and after taking all things into consideration, including it's true measurements, of size and weight, we discounted it as just too bulky to be easily manageable in and out of the motorhome locker apart from everything else. 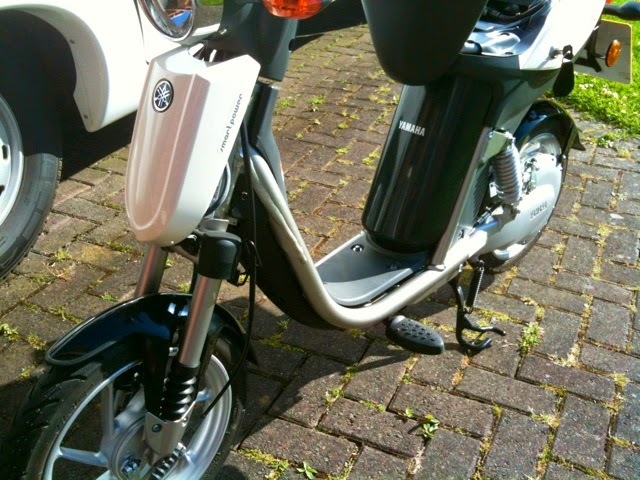 The Yamaha on the other hand is this company's first entry into the world of commercially viable electric scooters. The technology, as far as I can see, hasn't yet reached the required level. To be of real use they first have to be capable of a consistent speed of 30 mph with a range of say 100 miles. Although the little EC-03 has a claimed range of up to 20 miles, that obviously depends on what power setting is used, the terrain, ambient temperature, and weight of the rider. 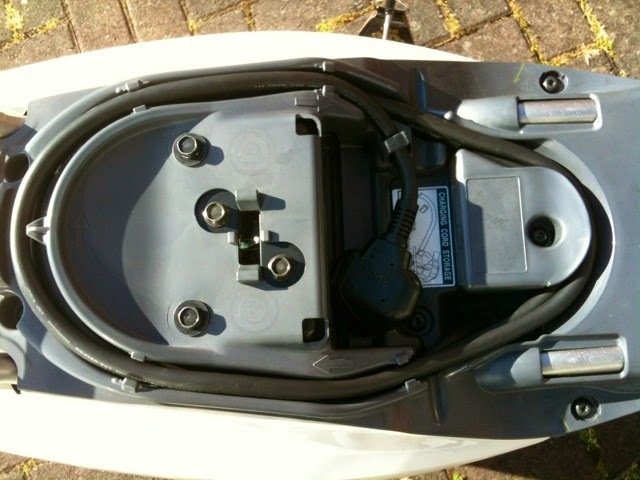 According to initial reviews a more realistic range is between 12-15 miles with a 15 stone rider as opposed to the 9 stone "test dummy", and that itself is dependent on using the lower power setting with its top speed of only 20 mph. It's UK launch "list price" was also high at £2599, although the company have recently been offering an £800 cash back scheme, which possibly indicates slow sales. 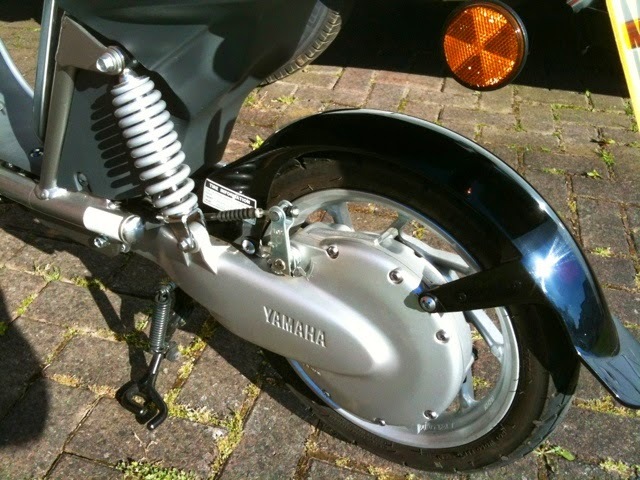 Having said that, we intend it to only replace a pedal bike, its build quality, being from Yamaha is first class, and the one I have bought is a "demo" from 2013, with only 20 miles on the clock, at a very much reduced £1200 price tag, which I managed to reduce by a further £100. Its physical size and weight is also much less than the Pulse at only 56 kg, although I do have a suspicion that they were glad to see it go! I am happy enough to give it a try having assessed how we want to use it. As with all electric vehicles that are presently available, if you have measured their limitations against intended use, then hopefully there will be no disappointments. 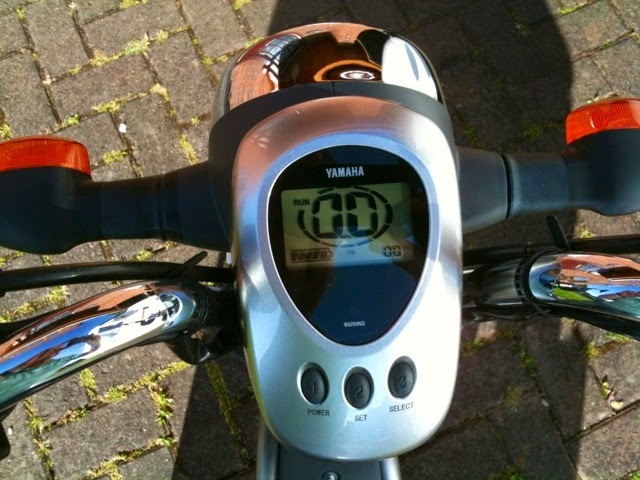 This is a launch review for the Yamaha EC-03: 2012 Yamaha EC-03 Review. and for those who want a more technical overview, here is the Yamaha pre-launch press release: Yamaha EC-03 launch press release. Time will tell whether I made the right decision or not, and I will of course post my findings here. 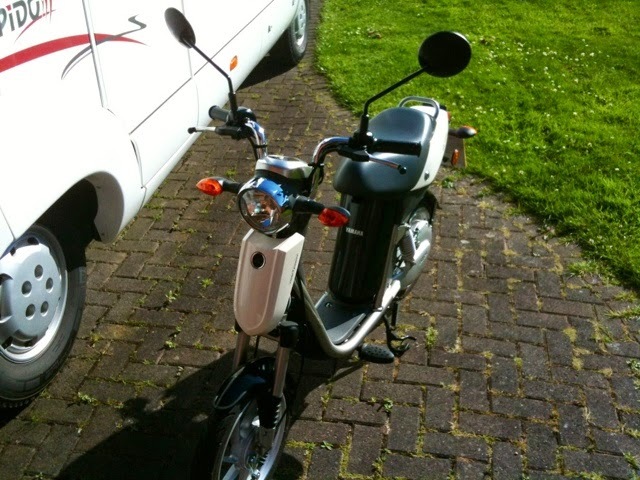 Both these bikes are classed as mopeds in the UK, and as such bring with them complicated driving license restrictions. However, if you hold a full car driver's license, and passed your driving test before 1st February 2001, you can drive a moped without L plates or having taken Compulsory Basic Training, (CBT), although I would always recommend at least doing that for safety reasons. All you need to know about UK motorcycle driving licenses can be found here: Riding a motorcycle or moped in the UK. I have held a full motorcycle license and have consistently owned motorcycles from being sixteen until January 2013 when I gave up my 2008 Suzuki 1200 cc to my son, my previous bike to that being a Yamaha R1. This will be a totally different experience! This is another aspect of UK motorhome ownership that causes confusion not only to its owner, but also to those within the MOT trade. And it revolves around this - the locker or "garage" that is sometimes provided within the body of a motorhome that is capable of carrying "goods". The provision of such a garage in a motorhome could have serious implications in relation to how it is tested for being roadworthy as I will try and explain now. Yesterday, I submitted our Rapido motorhome for a weighbridge certificate in it's fully loaded touring trim. It revealed that it's total gross weight as we intend to use it was 3340 kg, with a front axle weight of 1640 kg and a rear axle weight of 1660 kg. The plated weight limits are 3500 kg gross, front axle 1850 kg, and rear axle 2120 kg, so we are well within limits. 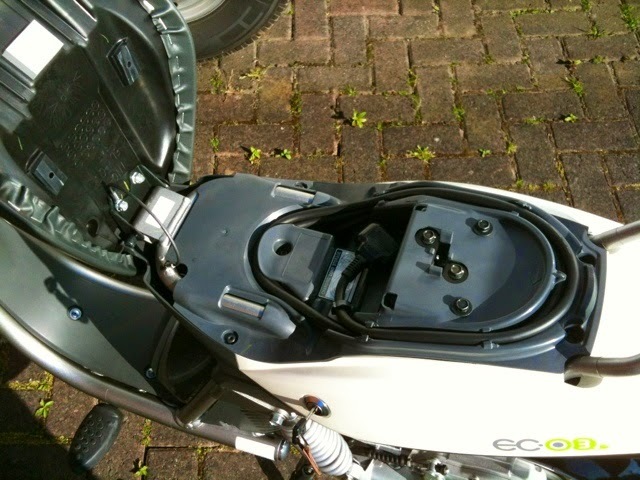 This now opens up the possibility of placing an 85 kg 50cc motor scooter in the rear "garage". However, there is one last thing to consider. Motorhomes are registered in the UK with DVLA with the body type "Motor Caravan". In the past VOSA (Vehicle and Operator's Services Agency), now called Driver and Vehicle Standards Agency from April 2014, applied the term quite loosely, but in recent years have become more strict in applying the regulations. There are two different vehicle definitions that apply here, and first we need to look at those. 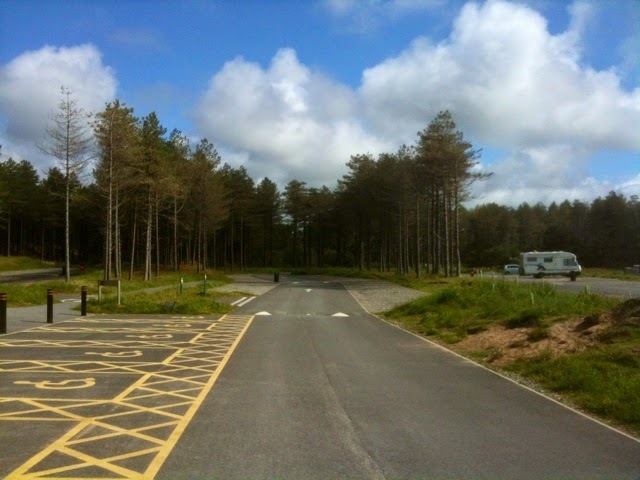 A motor caravan is a motor vehicle, not being a living van, which is constructed or adapted for the carriage of passengers and their effects and which contains, as permanently installed equipment , the facilities which are reasonably necessary to enable the vehicle to provide mobile living accommodation for its users. Motor caravans are not classed as goods vehicles for MOT test purposes and are therefore in the class IV or V depending on their seating capacity but regardless of their size or weight. A living van is a vehicle, whether mechanically propelled or not, which is used as living accommodation by one or more persons and which is also used for the carriage of goods or burden which are not needed by one or more such persons for the purposes of their residence within the vehicle. Living vans are classed as goods vehicles, and depending on their weight, are either class IV or VII within the MOT test scheme or are subject to HGV plating and testing. This is all becoming a little legalese, but in plain terms what does it mean for the likes of me? For vehicles with a gross vehicle weight between 3000 kg and 3500 kg. Goods are not restricted to items carried for "hire or reward", and in this context are items that are "not needed by persons for the purpose of their residence within the vehicle", but could, and does throw open the possibility that cycles and mopeds could be classed as goods here. It is up to the owner of the vehicle to declare at the time of testing what purpose the vehicle is to be used for. A class IV test could be conducted in these circumstances, even with the garage, but if carriage of goods intent is declared, then a class VII test will be conducted. If subsequent Police roadside checks reveal that the vehicle is being used for carriage of goods, and the correct test certificate is not in place, then a prosecution could follow. Vehicles in these classes are the subject of testing after the first 3 years of use, and then annually thereafter. For vehicles weighing over 3500 kg gross maximum vehicle weight. Vehicles that are classed as "living vans" as above, and are over 3500 kg gross vehicle weight become the subject of the Goods Vehicle (Plating and testing) Regulations 1988, and as such are required to be tested after their 1st year of use, and then annually thereafter. The testing process for this class of vehicle is also more complicated. See Vehicle Classes for MOT for information on classes of vehicle in relation to the MOT testing scheme. A quick check of my own motorhome's MOT test history reveals that it has been tested as a standard class IV motor caravan in its past. 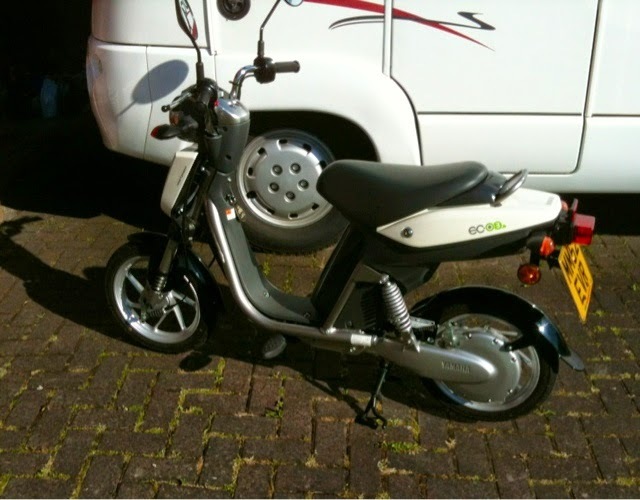 However, the dealer who sold it to me submitted it for testing as a class VII living van, as it is capable of carrying a moped within it's "garage". Consequently, I am now fully legally entitled to carry a scooter for transportation once at our destination if I choose to do so. It would appear that highway robbery is once again on the increase in Europe, in particular Spain, as reported here, after updated information was recently released from the UK Foreign office. Foreign Office makes new alert on highway robbers targeting UK tourists. Here you can view CCTV footage from a Spanish highway in daylight from 2011 where a foreign motorist was targeted. Please, if you are due to travel on the Continent, please be aware that this could be a problem and take every precaution to try and prevent it from happening to you. This has been happening in both France and Spain in recent years. Take note of the translated script from the Spanish police officer. Take care! 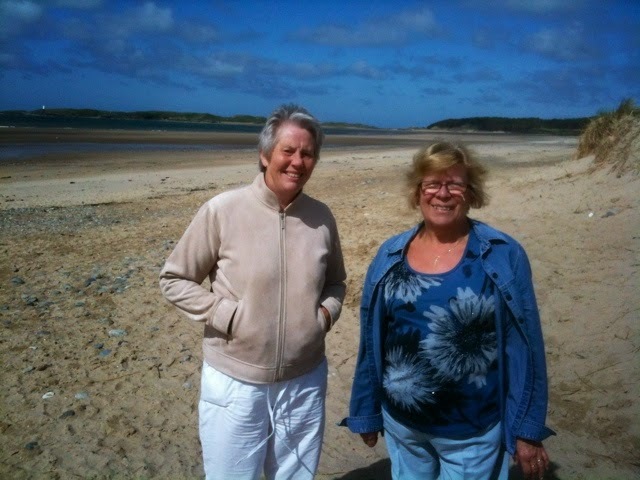 We are visiting friends who live on the beautiful Island of Anglesey and the weather has again been warm and sunny. 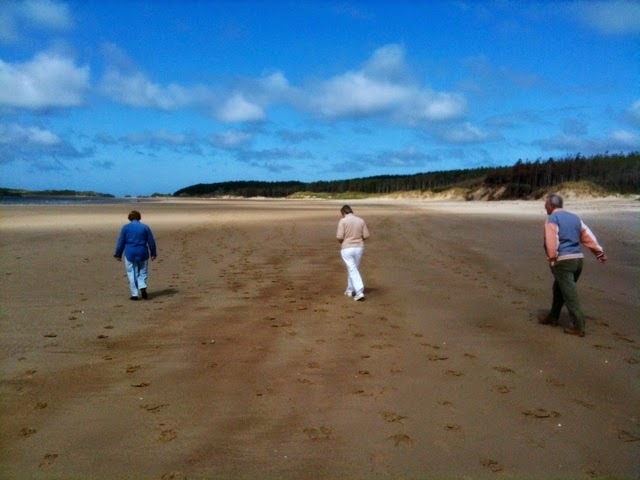 Today's day out of choice was to Niwbwrch, (Newborough) Beach, one of the very few places we haven't already been to here, as both Margaret and I both made regular holiday visits here with our parents as children. We had a picnic lunch on one of the provided benches set around the area. With the tide out the beach was huge, and as you walk from the car park there is signage that states dogs are allowed to the left, but the right is reserved for those who prefer a dog free environment. 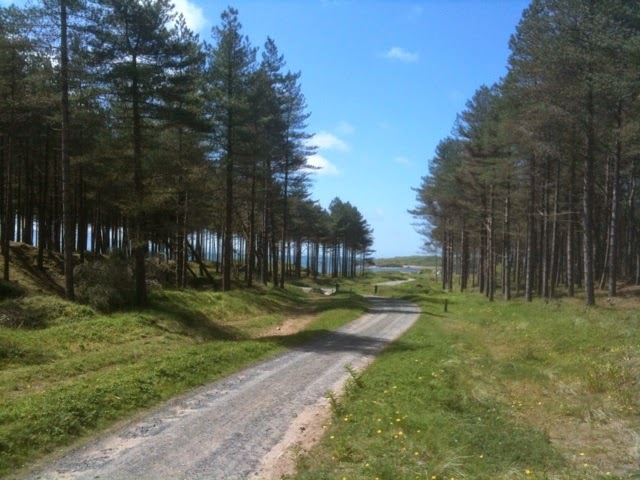 A walk of several miles of coastline is possible, with the ability to turn right into the forest at any time, where the gravel tracks can be followed to make an easy return to the car parking area possible. 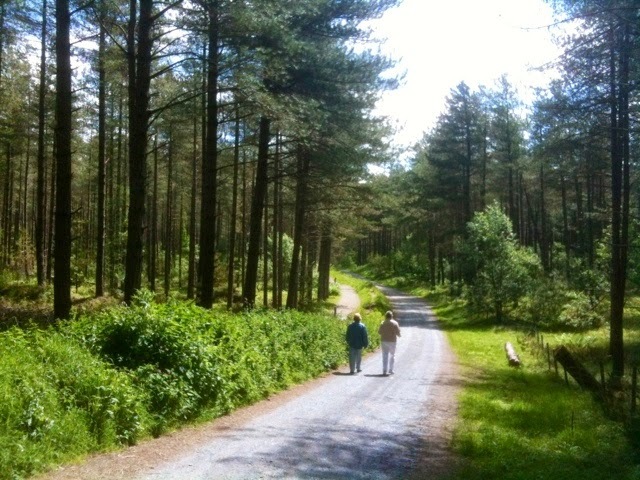 This is a conservation area where a colony of red squirrels has been introduced and are now thriving. Also there are large colonies of ravens, and it is from this area that the ravens are taken to replenish those at the Tower of London. 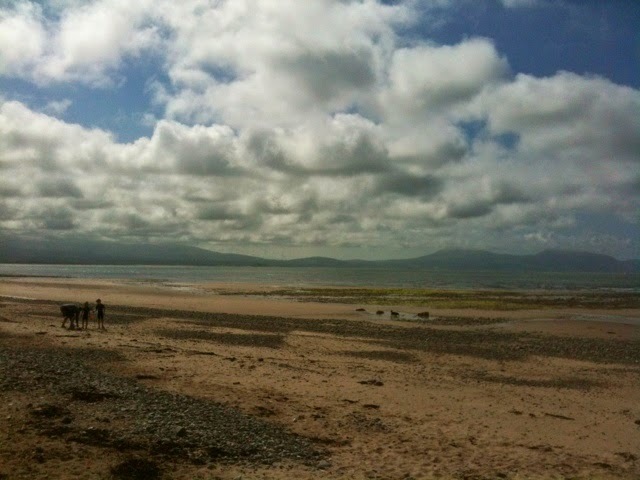 This has been a very pleasant day, and Anglesey remains one of our favourite places, which hasn't changed too much from the memories of our childhood. 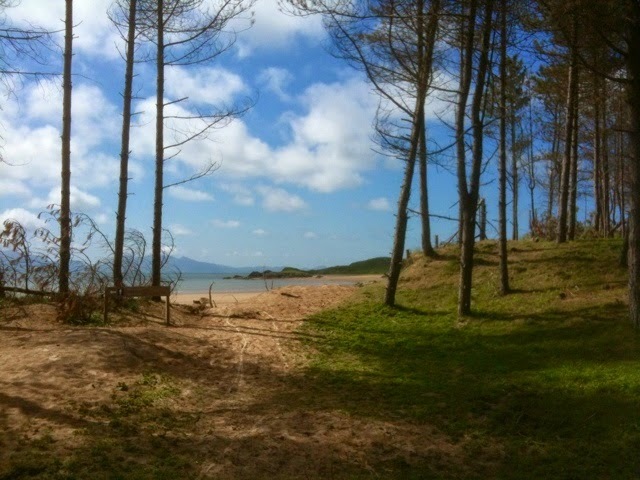 The whole area seems to have escaped the modern tendency to overdevelop UK tourist spots, and we like that. Don't tell anyone.